Here at ChiIL Mama we're absolutely elated to be partnering up with American Theater Company on a fabulous ticket giveaway. One of our lucky readers will win 2 tickets ($116 value) to American Theater Company's Jeff Recommended production of the musical comedy Xanadu. Tickets are good for the winner's choice of one of the following performances: June 24 at 8 p.m.; June 26 at 2 p.m.; June 29 at 8 p.m. or June 30 at 8 p.m. Enter early and often through midnight June 21st. 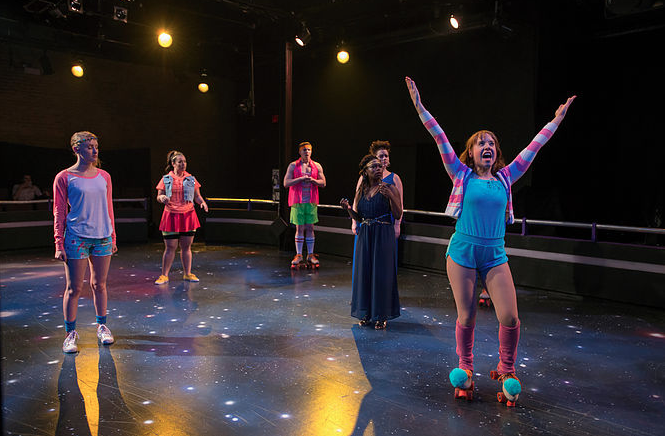 American Theater Company’s production of the musical comedy Xanadu turns the theater’s warehouse space into a roller disco. This spoof of the 1980's camp classic film features Electric Light Orchestra (ELO) songs including “Evil Woman” and “All Over the World.” Don’t forget your leg warmers! Ah Xanadu. The high art of 80's neon, leg warmers, rainbow unicorns and roller disco lives on! American Theater Company's scrappy little musical deserved their unanimous standing ovation for this one. Don't be fooled by the storefront aesthetic. This cast is full of powerhouse vocalists and quadruple threat pros who not only sing, dance and act, but do it on roller skates! I'm still grinning ear to ear from this hilarious and heartfelt parody. And I'm dazed and amused they managed to transform their storefront into a full on mini roller rink and theatre in the round! This sweet setup makes for intimate staging, and provides some great audience interaction laughs, and in your face (or your lap) physical comedy. One line from the show keeps coming back to me, "It's like children's theatre for gay 40 year olds." Yes... Yes it is. This campy comeback is sure to steal hearts. It's wittier and far funnier than the movie it sprang from, with the original pop hits and absurd premise intact, and the addition of better tunes, too. Lili-Anne Brown (Director) has guided this production to the height of hilarity. Landree Fleming (Kira) is a stellar stand out. The quick pacing and impeccable comedic timing of the entire ensemble makes this show a true treat. Gone are the peasant blouses and billowing skirts of the movie version of Kira, though the muses do have modified 70's versions of toga like robes in the form of maxi dresses and parachute pants. We dig Kira's ultra 70's costume choices of a terrycloth jumpsuit, leg warmers and giant pompons on the skates. Sonny was a vision of the past in tube socks, head band, cut offs and neon. The casting of several of the muse sisters as men added extra levels of fun to this production, and they camped it up classically. We also loved the gentle and too true digs on the whole 80's aesthetic, and on Olivia Newton John's Australian accent and affectations. They even snuck in a nice little Singin' in the Rain tribute for Gene Kelly, who was also in the original 1980 movie. The muses have a much bigger role in the stage version, including an overt plot to hex Kira and make her fall in love with a mortal. I prepped for the opening with a family XANADU movie night with my husband, who vaguely remembered it, and my teens who had never seen it. XANADU came out when I was 13 and my husband was 15 -- exactly the ages our kids are now. It was a fun trip through the waaaaay back machine, especially since the movie recreates both the 40's and 80's. ATC's musical version stands alone as a fun romp through the decades, whether you've seen the movie or not, but if you have seen the movie (especially recently) the stage show lampooning is far funnier. It's tough to strike a balance between parody and snark and ATC's XANADU rocks that balancing act with panache. This is an absolute must see and fun for all ages. 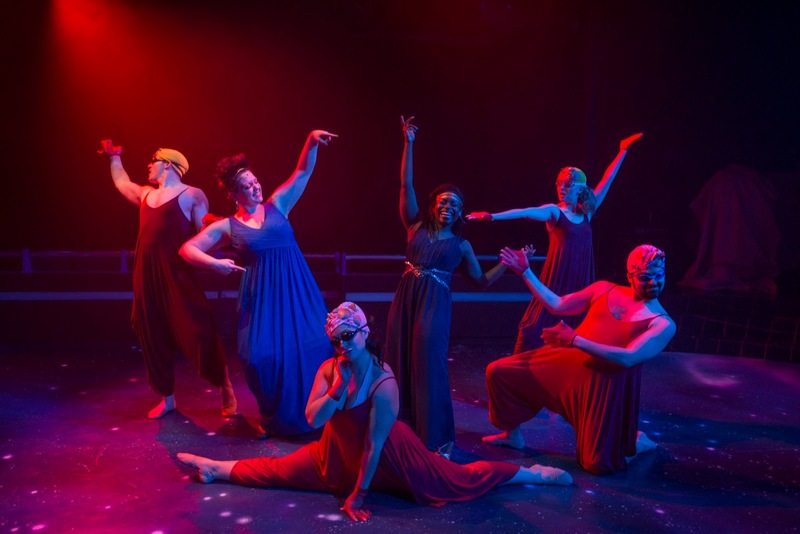 This ATC tribute is performed in memory of one of their inspirations, former artistic director, PJ Paparelli, who's untimely death last year shook the company and sent ripples through Chicago's theatre community. It's so great he can be remembered for his driving, documentary style productions on social problems, like Chicago's public housing crises, and also in a playful, high camp way, with XANADU. Maybe he's hangin' on the other side with Zeus and the muses today?! I wouldn't be surprised. At any rate, his life, and work, and even his silly film favorites continue to inspire ATC and Chicago's creative scene. Xanadu takes place in Venice, California in 1980. Struggling artist Sonny Malone seeks to create his own version of the American dream by renovating an abandoned warehouse into a venue for world-class entertainment – a roller disco! 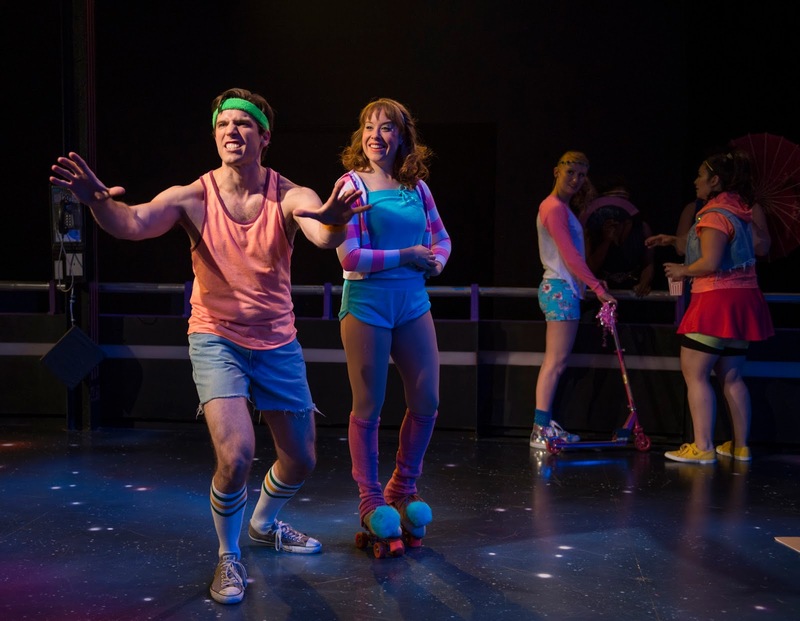 A hilarious and modern update of the1980’s camp classic, Xanadu celebrates the artist’s muse, even when it comes from the most unlikely of places. 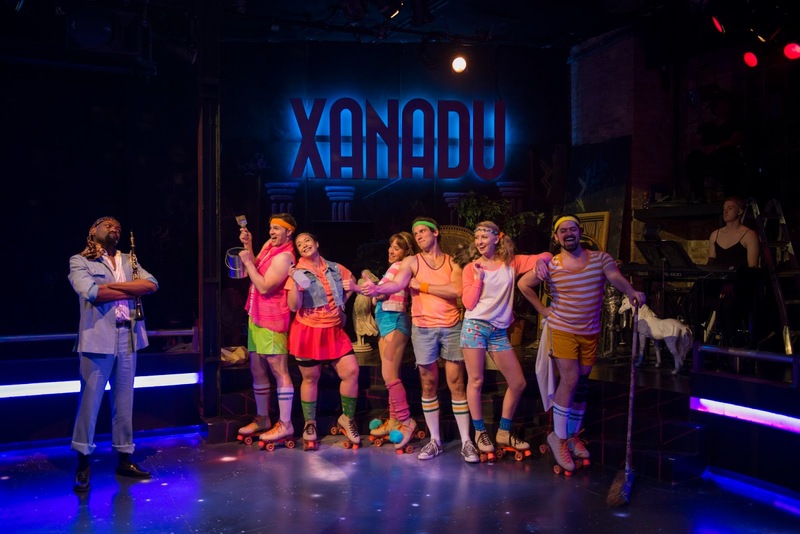 Regular Run: June 7–July 17: Tuesday–Saturday evenings at 8 p.m. with matinees on Saturdays and Sundays at 2 p.m.
American Theater Company (ATC) opened musical comedy Xanadu, the final production of its Legacy Season, Sunday, June 5. Presented as a tribute to ATC’s late Artistic Director PJ Paparelli—a not-so-secret fan of this camp classic—Xanadu is directed by Lili-Anne Brown and runs at ATC now through July 17, 2016. The production has music and lyrics by Jeff Lynne and John Farrar and a book by Douglas Carter Beane, based on the 1980 Universal Pictures film of the same title. Single tickets for Xanadu range from $48-$58. Student tickets are available for $15 with valid student ID in-person at the Box Office. More information and tickets are available by visiting the ATC Box Office at 1909 W. Byron Street, by calling 773-409-4125 or visiting www.atcweb.org. The cast for ATC’s tribute production of Xanadu includes Missy Aguilar (Calliope), Kasey Alfonso (Erato) Karla L. Beard (Melpomene), Jim DeSelm (Sonny), Landree Fleming (Kira), Aaron Holland (Danny Maguire, Zeus), Michelle Lauto (Kira U/S & Swing), Hanah Rose Nardone (Euterpe), James Nedrud (Terpsichore/Sonny cover), Daniel Spagnuolo (Thalia/Danny cover), and Cameron Turner (Swing). Missy Aguilar (Calliope) most recently appeared as Baby Rose in Babes in Arms, Oolie/Donna in City of Angels with Porchlight Music Theatre and U/S Ivy (performed) in The Man Who Murdered Sherlock Holmes with Mercury Theatre. Last spring and summer she was happy to spend on the pier at Chicago Shakespeare Theater with Disney’s The Little Mermaid (Atina/Ensemble, U/S Ursula), and Sense and Sensibility: A New Musical (U/S Fanny/Mrs. Jennings, performed). Ms. Aguilar’s other recent Chicago area credits include: Women on the Verge of a Nervous Breakdown (Ivan’s Concierge, U/S Lucia) and The Beverly Hillbillies (Cousin Pearl/Gloria) with Theatre at the Center; Les Miserables (Ensemble & U/S Mdme. Thenadier) with Drury Lane; Nunsense (Sister Hubert) with Fox Valley Repertory; and In The Heights (Ensemble & U/S Abuela Claudia) with Paramount Theatre. Kasey Alfonso (Erato) makes her ATC debut. Chicago credits include: West Side Story, Rent and In The Heights (Paramount Theatre); Seussical (Chicago Shakespeare); Iphegenia in Aulis (Court Theatre); Wonderland (Chicago Children’s Theatre); Carrie: The Musical (Bailiwick Chicago); and Smokey Joe’s Café (Theo Ubique). She also stars as Kid Zhuyin in the web series The Adventures of Jacketmen. Ms. Alfonso is a proud graduate of the Chicago College of Performing Arts. Karla L. Beard (Melpomene) returns to ATC after appearing in Rent. She has appeared in Second City productions of What the Tour Guide Didn’t Tell You in the Up theatre, Soul Brother, Where Art Thou, Rush Limbaugh! The Musical, The Absolute Best Frigging Time of Your Life on the ETC stage, an assortment of Second City BizCo productions, several episodes of Chicago Live! and briefly in The Second City Guide to the Opera and Let Them Eat Chaos. TV/Film credits: Chicago PD, Empire, Mind Games and a variety of commercials. Other credits include: Mamma Mia! (National Tour); Doubt and Little Shop of Horrors (Peninsula Players); Sunday in the Park with George, Anyone Can Whistle and Princess and the Black-eyed Pea (Ravinia); The Amen Corner (Goodman Theatre and Huntington Theatre); The Piano Lesson (Madison Repertory Theatre; artist and music director); Miss Saigon and Hot Mikado (Marriott Lincolnshire); Ain’t Misbehavin’ (Arkansas Repertory); and Ragtime (Porchlight Theater). Ms. Beard received Jeff Nominations for her portrayals of the title character in the Midwest premiere of Dessa Rose, TiMoune in Once on This Island and Young Barbara Jordan in Voice of Good Hope at Victory Gardens. Jim DeSelm (Sonny) makes his ATC debut. Chicago area credits: West Side Story and Beaches (Drury Lane Oakbrook); Road Show (Chicago Shakespeare Theater); James Joyce’s The Dead (Court Theatre); Fiddler on the Roof (Paramount Theatre); South Pacific (Marriott Theatre); Godspell and Jesus Christ Superstar (Theatre at the Center); Juno (TimeLine Theatre Company); A Catered Affair (Porchlight Music Theatre); Parade and Floyd Collins (Boho Theatre; Jeff Award Nomination - Actor/Musical); The Mikado (The Hypocrites); The Last Five Years (Kokandy Productions, Jeff Award Nomination - Actor/Musical); and Pump Boys & Dinettes (Theo Ubique Cabaret Theatre, Jeff Nomination - Music Direction). Regional Credits include: Snapshots (Village Theatre/Arizona Theatre Company); Oklahoma!, Once Upon A Mattress and Plain & Fancy (Round Barn Theatre). Television credits include Chicago P.D. (NBC) and Double Cross (Investigation Discovery). Landree Fleming (Kira) makes her ATC debut. She was most recently seen as Penny in Hairspray (Paramount Theatre). Other Chicago credits include: Seussical (Marriott Theatre); Spelling Bee (Drury Lane Theatre, Griffin Theatre, Theatre at the Center); Gypsy (Chicago Shakespeare Theater); Godspell (Theatre at the Center); She Kills Monsters (u/s, Buzz22); Reefer Madness (Circle Theatre, Jeff Nomination - Best Actress); and The Giver (Adventure Stage Chicago). Ms. Fleming is a member of musical sketch comedy group Off Off Broadzway. She is represented by Gray Talent. Aaron Holland (Danny Maguire, Zeus) returns to ATC. Recent Chicago credits include: SISTER ACT! (Marriott); Seussical! (Chicago Shakespeare Theater); Hair (American Theater Company); The Color Purple (Mercury Theatre); A Christmas Carol (Goodman Theatre); Goodnight Moon and Dot & Ziggy (Chicago Children’s Theatre); and Passing Strange (Bailiwick Chicago). TV credits: Chicago Med. Mr. Holland received a BFA in Theatre Performance from Virginia Commonwealth University. Michelle Lauto (Kira U/S & Swing) makes her ATC debut. Favorite credits include the Chicago premieres of Murder Ballad (Bailiwick Chicago), 35mm (Circle Theatre) and The Boy From Oz (Pride Films & Plays). Ms. Lauto is a proud graduate of The Second City Training Center Conservatory. Hanah Rose Nardone (Euterpe) makes her ATC debut. Chicago credits include: Bye Bye Birdie and White Christmas (Drury Lane Oakbrook); The Little Mermaid (Chicago Shakespeare Theater); and The Wild Party, Thoroughly Modern Millie, Ripper and Spring Awakening (CCPA at Roosevelt University). Regional credits include: 42nd Street, Big River, Legally Blonde and The Sound of Music (The Little Theatre on the Square); Guys and Dolls, Boeing Boeing, Footloose and Cabaret (Timber Lake Playhouse). Ms. Nardone recently received her BFA in Musical Theatre from The Chicago College of Performing Arts at Roosevelt University. James Nedrud (Terpsichore/Sonny cover) makes his ATC debut. Recent credits include: Angry Fags (Pride Films and Plays at the Steppenwolf Garage); Mary Poppins (Paramount Theatre, Aurora); Les Miserables (Drury Lane Theatre, Oak Brook); Applause (Porchlight Revisits); WOZ: A Rock Cabaret (Kim Lawson at Victory Gardens); Three Little Pigs (Emerald City); and Under a Rainbow Flag (Pride Films and Plays; Jeff nomination for best supporting actor in a musical). He has also worked with Chicago Shakespeare Theater, About Face Theatre and Bohemian Theatre Ensemble, among others. Mr. Nedrud is a proud graduate of the Chicago College of Performing Arts and member of Pride Films and Plays. Daniel Spagnuolo (Thalia/Danny cover) has worked at The Paramount Theatre, Porchlight Music Theatre, ProfilesTheatre, Boho Theatre Ensemble, The Little Theatre on the Square, and Light Opera Works. Danny’s choreography credits: Rent (Theo Ubique Cabaret); The Full Monty (Kokandy Productions; Non-Equity Jeff Award Nomination); Godspell and A New Brain (Brown Paper Box Co.; Broadway World Nominations); The Little Mermaid (Drury Lane Oakbrook); and Ruthless (Big Noise). Mr. Spagnuolo has served as assistant choreographer on such productions as A Funny Thing Happened on the Way to the Forum (Porchlight Music Theatre) and American Idiot (The Hypocrites). Cameron Turner (Swing) makes his ATC debut. He is a Chicago-based actor/director/choreographer and proud graduate of The Chicago College of Performing Arts at Roosevelt University. Previous performance credits include: Jesus Christ Superstar (Theo Ubique Cabaret); DamnYankees and Annie Get Your Gun (Light Opera Works); and Les Miserables and A Chorus Line (Timber Lake Playhouse). Other Chicago credits include: 35MM: A Musical Exhibition (Director/Choreographer - Circle Theatre); The Boy From Oz (Choreographer - Pride Film & Plays); Jesus Christ Superstar (Asst. Choreographer - Theo Ubique Cabaret); and The Wild Party (Asst. Choreographer - Bailiwick Chicago). Douglas Carter Beane’s (Playwright) plays include: The Nance, The Little Dog Laughed (Tony, Olivier nominations; GLAAD Media Award), Mr. & Mrs. Fitch, As Bees in Honey Drown (Outer Critics Circle, Gassner Playwriting awards), Advice From a Caterpillar, The Country Club, Music From a Sparkling Planet, The Cartells. Musicals: Rodgers + Hammerstein’s Cinderella(Tony nom. ), Sister Act (Tony nom. 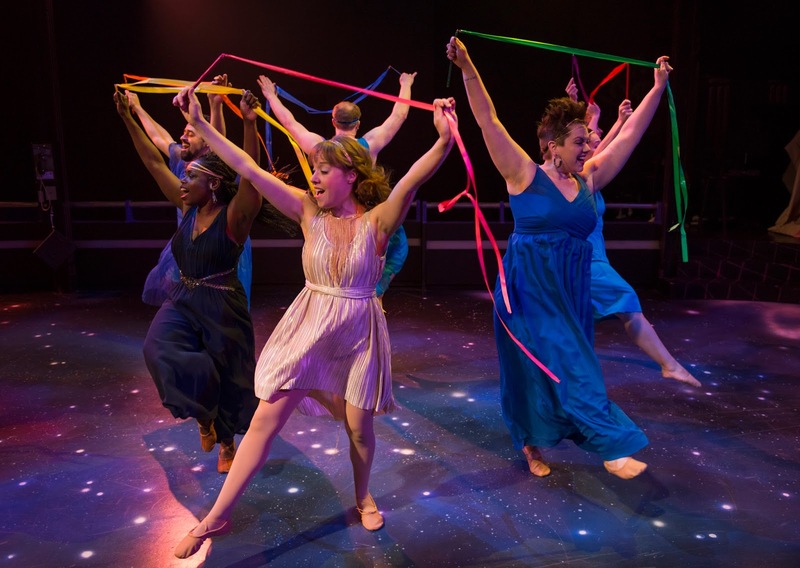 ), Lysistrata Jones (Tony nom. ), Xanadu (Tony nom. ; Drama Desk, Outer Critics Circle awards). Revues: White Lies; Mondo Drama; The Late, Late Show. Opera: Die Fledermaus (Met). Screenplays: To Wong Foo, Thanks For Everything! Julie Newmar; Advice From a Caterpillar (Best Feature, Aspen Comedy Festival). Producer: 21 plays as founder and artistic director of New York’s Drama Dept. Member of the Dramatists Guild and is on the Playwrights Walk of Fame at the Lucille Lortel Theatre. Jeff Lynne (Music and Lyrics) is a founding member of the Electric Light Orchestra, or ELO, whose discography includes five platinum-selling albums: Face the Music, A New World Record, Out of the Blue, Discovery, and Xanadu. In addition to his recording work with the ELO, Lynne co-produced studio albums by George Harrison (Cloud Nine), Roy Orbison (Mystery Girl), Tom Petty (Full Moon Fever), Ringo Starr (Time Takes Time), and Paul McCartney (Flaming Pie). He co-founded the "supergroup," the Traveling Wilburys, with Tom Petty, Roy Orbison, Bob Dylan, and George Harrison. Lynn co-wrote and produced the track "Let It Shine" for Beach Boy Brian Wilson's debut solo album in 1988. John Farrar (Music and Lyrics) is a music producer, guitarist, singer, and former member of the British rock group, The Shadows. He worked extensively with Olivia Newton-John, producing fourteen of her albums and writing many of her hit singles, including "You're the One That I Want" (Golden Globe nom. ), "Hopelessly Devoted to You" (Academy Award nom. ), and "Have You Never Been Mellow." He co-wrote with Tim Rice songs for the 1995 musical, Heathcliff, and collaborated with Francis Ford Coppola to create songs for a new musical, Gidget. Lili-Anne Brown (Director) is the Artistic Director of Bailiwick Chicago. She received the Joseph Jefferson Award in 2014 (Direction of a Musical) for her direction of Ahrens & Flaherty's Dessa Rose. Other directing credits include: Michael John LaChiusa's See What I Wanna See (Steppenwolf Theatre Garage Rep), the critically acclaimed Chicago premiere of Passing Strange (BTA Award for Best Director of a Musical, Jeff Award nomination for Best Director of a Musical), and the world premiere of Princess Mary Demands Your Attention by Aaron Holland, for Bailiwick Chicago; On the Boards and Hearts of Darkness at Roosevelt University; and Hairspray, Unnecessary Farce, Cabaret, Sweet Charity, The 25th Annual Putnam County Spelling Bee, and Buddy: The Buddy Holly Story, all at Timber Lake Playhouse, where she is an Artistic Associate. Upcoming next season: American Idiot at Northwestern University and Jabari Dreams of Freedom by Nambi Kelley at Chicago Children's Theatre. She works as an actor, director and educator, both locally and regionally, and is a member of Actors’ Equity Association and SAG-AFTRA, and an associate of SDC. Lili-Anne is a Northwestern University graduate (Performance Studies), and a proud native Chicagoan. 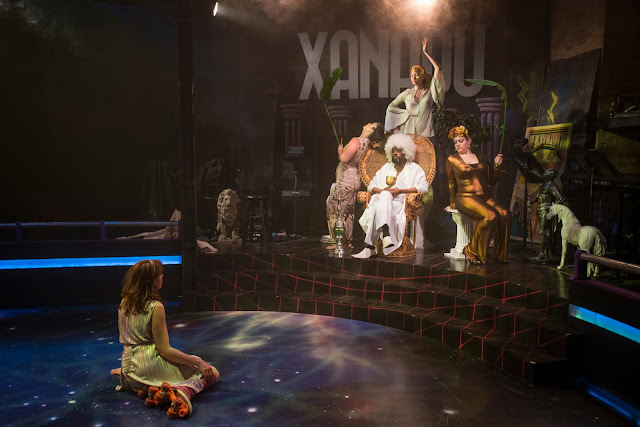 Disclosure: Thanks to American Theater Company for providing one of our lucky readers with 2 tickets ($116 value) to their Jeff Recommended production of the musical comedy Xanadu. I have also been given a pair of tickets for the press opening to facilitate my review. As always, all opinions are my own.